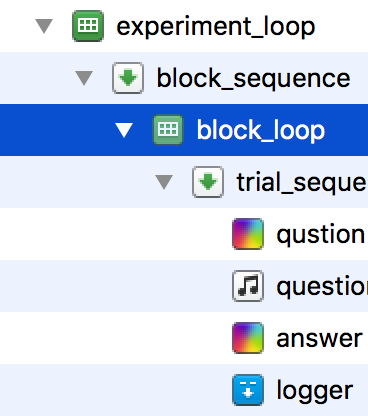 I created a block_loop in OpenSesame like this. The block contains 168 trials and I want it to run 7 repetitions for each trial. However, that adds up to 1176 sentence which is obviously too much for subjects to do all of them at once. I want to randomize and split the 1176 trials into 8 blocks (each block with 147 trials). Does anyone know how to achieve this in OpenSesame? Thanks. 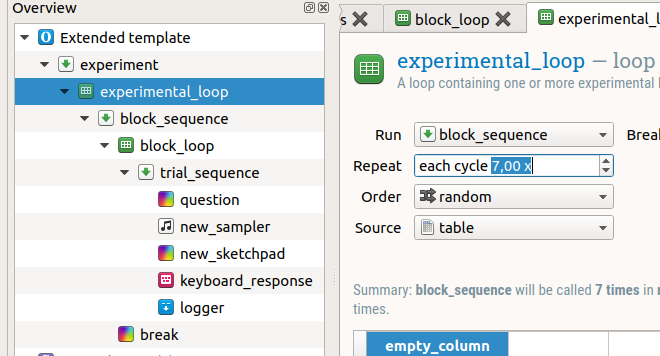 You can change the number of repetitions of the block_sequence in the experimental_loop (instead of in the block_loop item), as in the example below. By the way, I would recommend to collect participants' responses with a keypress_response item, rather than with a sketchpad item. Thanks, Lotje! It is what I wanted! I didn't use the keypress_response because I'm doing some speech production experiment and am using OpenSesame to just present the stimuli to my subjects. My data will be collected on a different machine. The logger is just like an experiment memo that tells me which data is from which trial.